FIXED Mount Holes (WxH): 2" x 2" , 3" x 3" , 4" x 4" , ~8" x 4" , ~8" x ~8"
TV mount plate: 8.66" x 8.66"
First Arm Extension (From wall plate): 13.97"
Second Arm Extension (From first arm to where TV mount plate attaches): 11.41"
Min Depth from Back of Mount to Wall when fully collapsed: 3.5"
Max Extension from wall to TV mount plate: 26.5"
Installation Note: This mount MUST be securely attached to studs, or other suitable surface. 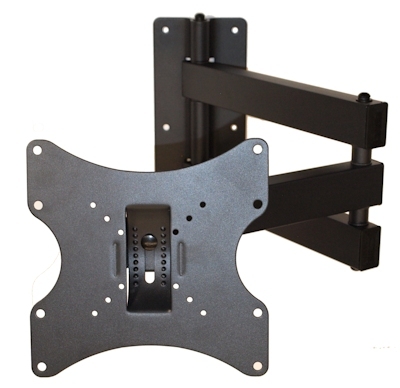 Do NOT mount directly to drywall unless using our specialized drywall mount kits. May be safely attached to a SINGLE stud (either left or right side), providing all three screws are securely attached to the CENTER of the stud. 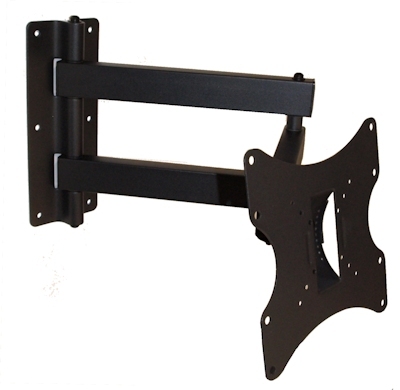 Depending on horizontal size of TV to be mounted, arm may be visible when mount is fully collapsed against wall.